Location: 157.0 miles (252.7 kilometers) west-northwest of Vilnius, Lithuania. Google (location in Lithuania); Google (satellite view of the current town). Švėkšna is located in western Lithuania, east of the Baltic Sea, and has been inhabited for over two thousand years. 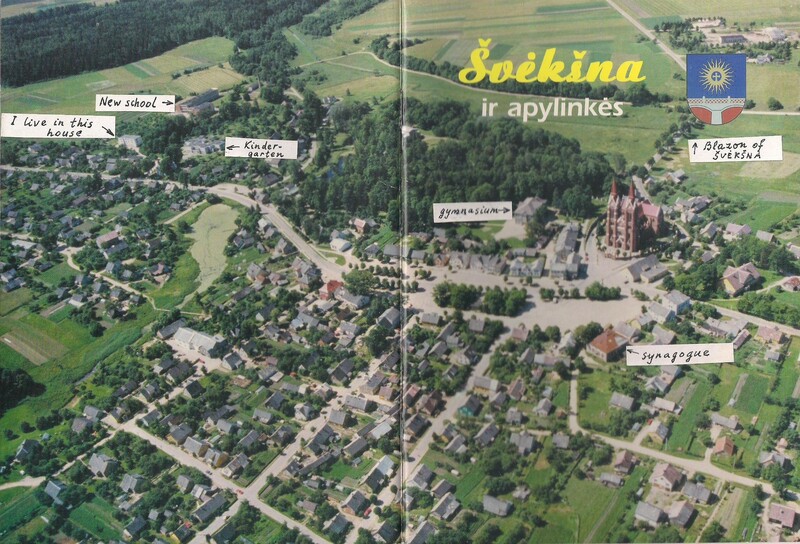 This aerial photograph appeared as the cover of a booklet about Švėkšna that Petras (Peter) Čeliauskas published in 2003. Photo Copyright © 2002 Sigitas Grincinaitis. Permission to print here was granted by the copyright owner in April 2012. Click on the photo to view a larger version (1.45 MB), which will open in a new window. Close the new window when you want to return here. 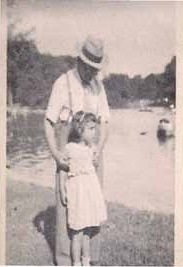 This is an article by Esther (Herschman) Rechtschafner about Švėkšna, home of her maternal Grandfather ZACHARIA MARCUS, including information about the Jewish Community of Lithuania as a whole. Mr. Marcus and Esther appear in the photo at the left (circa 1950). Student Articles -- The English translations of these articles were done by the Google translator program offered by the Stars21.com website. By Jonas Girskis: Original Lithuanian (PDF - 267 KB) | English Translation (PDF - 217 KB) -- The translation does not include any of the footnotes of the original article. This is an article by Esther (Herschman) Rechtschafner, with many photographs of Švėkšna and descriptions. These are views that can be seen in Švėkšna today. These photos show what the Jewish Cemetery looks like today. Many thanks to them and their leaders and organizers: Violeta Stonienė, Vilma Adomavičienė, and Monika Žąsytienė. Click here for further information about the Lithuania-Jewish-Cemetery-Project. These are modern photos made by Monika Žąsytienė and posted to Google+ showing houses in Švėkšna that once belonged to Jews. Photographs from the Švėkšna Museum's Project - "Švėkšna's Jewish Community is still alive in our memories"
The opening show in June 2012 was wonderful. The Youth Theatre from Klaipėda opened the event with their "impromptu performance." After that Monika showed the exhibition and publications, etc., about Švėkšna's Jews. Then all the museum's guests went to the Synagogue. They all noted the condition it is now in. Important guests were representatives of the Klaipėda Jewish community, Šilutė's district mayor, Švėkšna's elder, the director of Cultural Heritage and others. The project was organized and the photographs were sent by Monika Žąsytienė. These pre-World War II photos of Švėkšna appear on a Facebook site managed by Jonas Keturka (jonasketurka@gmail.com). This link displays two views of the town plots of Švėkšna in 1910. The two images were sent by the courtesy of Monika Žąsytienė. This is a map of Švėkšna that was drawn in 1924 before the great fire there. The image was sent by the courtesy of Petras Čeliauskas. This link shows a diagram of the town layout of Švėkšna made by Esther (Herschman) Rechtschafner as Zipporah Sandler remembers it from 1935. This map is from the Holocaust. It shows Švėkšna and the surrounding area and the dates of the murders. Inkakliai is where the Jewish women, children and some of the men of Švėkšna were murdered. 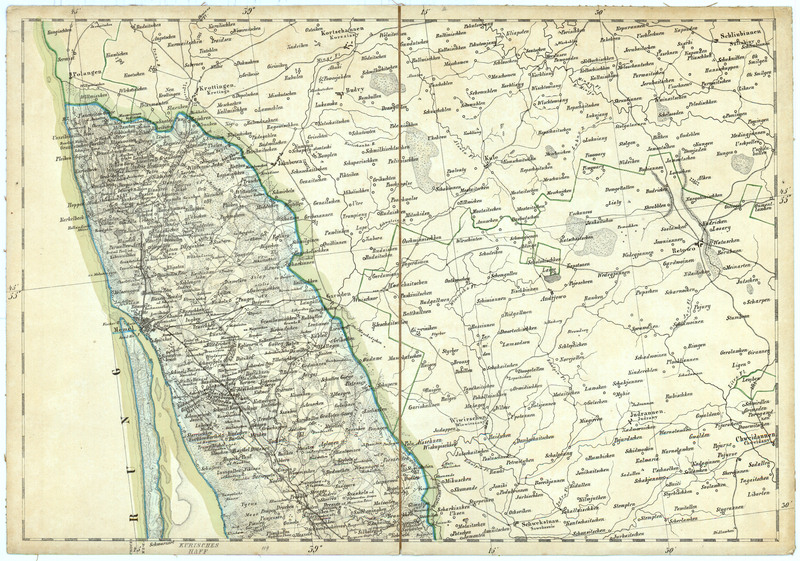 This is a map of Švėkšna as Naftali Ziv remembers it from the Summer of 1941, along with Naftali's explanation of the places depicted. The image was sent by the courtesy of Naftali Ziv and his wife Hanna. 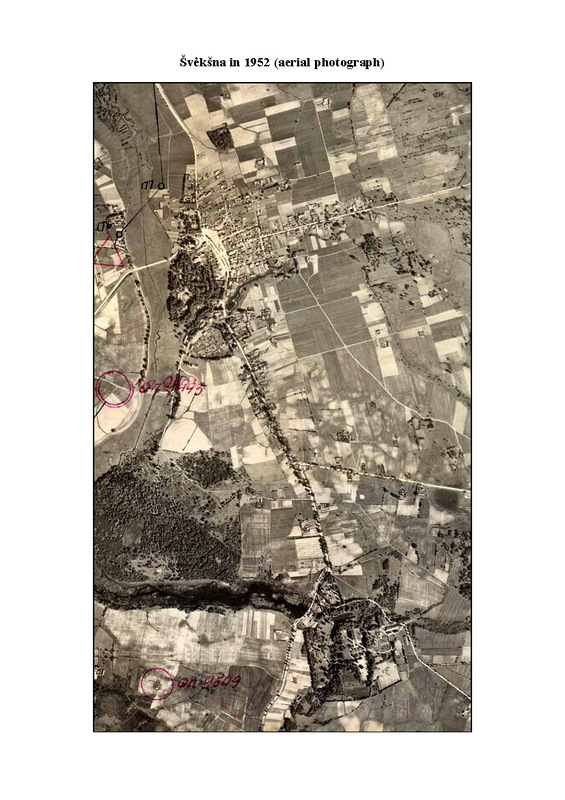 This aerial photograph of Švėkšna from 1952 shows the development of the town. This map shows the development of the town. This map of Švėkšna was drawn by Petras Čeliauskas in about 2002, who provided this image and gave his permission to display it here in April 2012. 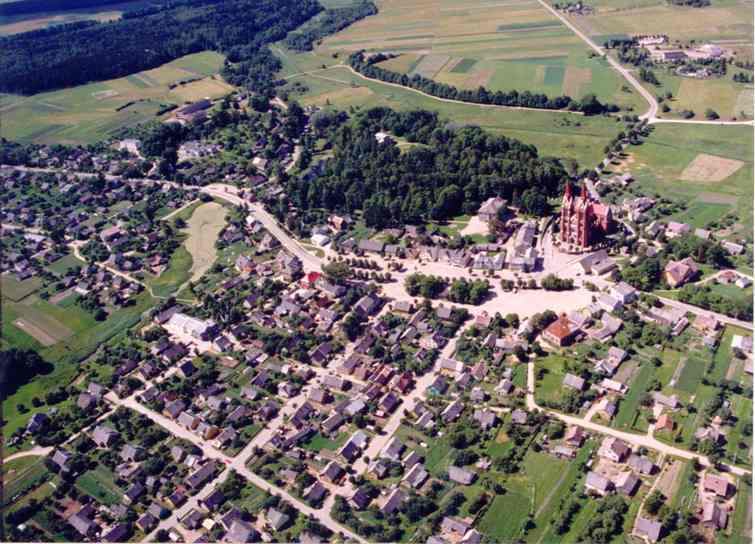 This is an aerial photograph of Švėkšna (also displayed above on this page) that Petras Čeliauskas used on the cover of his booklet about Švėkšna. Peter added labels to this copy pointing out places that would be interesting for people to see and know about before forwarding it to Esther Rechtschafner. This links to a satellite view of the current town of Švėkšna, opening in a separate window. This map shows the symbols for the synagogue and the Jewish cemetery. The number 143 under the town name is the number of dwellings. JewishGen Lithuania Database -- A multiple-database search engine, which incorporates databases containing more than two million entries from Lithuania. JewishGen InfoFile Index - JewishGen InfoFiles provide information at your fingertips on topics of relevance to Jewish genealogical research. The JewishGen Family Finder (JGFF) for Sveksna - A database of ancestral towns and surnames currently being researched by Jewish genealogists worldwide. Yad Vashem - Yad Vashem, containing the world's largest repository of information on the Holocaust, is the center for Holocaust research, documentation, education and learning. It is located in Jerusalem, Israel. The Central Archives for the History of the Jewish People - This facility was established in 1939. It holds the archives of hundreds of Jewish communities, as well as of local, national and international Jewish organizations and the private collections of many outstanding Jewish personalities. The Archives now hold the most extensive collection of documents, pinkassim (registers) and other records of Jewish history from the Middle Ages to the present day. It is located in Jerusalem, Israel. United States Holocaust Memorial Museum - This organization is America's national institution for the documentation, study and interpretation of Holocaust history. It is located in Washington, DC, USA. Website of Dr. Ruth Leiserowitz - Ruth Leiserowitz, Ph.D., is a German historian and has done much research on Eastern Prussia, including much traveling in the Lithuanian-Russian area. She is on the faculty of the Humbolt University in Berlin and the Klaipeda University. She is affiliated with the Berlin School for European Comparative History. Her main fields of research are Modern and Contemporary History, European History, specializing in Baltic, Polish, and Russian History, Cultural and Social History as well as Jewish History. The Synagogue of Švėksna - This website gives a brief history of the Švėksna Synagogue and displays several photographs. Click on the "Read more" tab at the website to see the history or "Gallery" to see photographs and building plans. Note, 16 Nov 2014: This material is currently not available. Please check back later. Copyright © 2012-18 Esther (Herschman) Rechtschafner. If you feel there is a benefit to you in accessing this site, your JewishGen-erosity is greatly appreciated.